There is no foreseeable decline in the escalation of demand for food ingredients as developing nations’ populations continue to mount. However, arable land is limited and consistently decreasing too. Coupled with changes to the environment that pollution has caused, there is a strong requirement for measures that can increase the efficiency or yield of limited arable land. Specialty fertilizers are a boon for agri-retailers and growers in order to increment crop production as they supply necessary nutrients during seasons when groundwater is low. Specialty fertilizers help soil to overcome deficiencies and attain greater fertility, and their adoption is on the rise. A recent business intelligence report developed at Transparency Market Research (TMR) has projected that the demand in the global specialty fertilizers market will expand at a notable CAGR of 5.7% during the forecast period of 2017 to 2025. In terms of revenue, the analyst of the report has estimated the market to attain a value of US$14,734.4 million, substantially more than the market’s evaluated worth of US$8,987.3 million as of 2016. The analyst of the report has highlighted a vendor landscape wherein the global specialty fertilizers market shares are fairly consolidated among a handful of major players. Major companies such as Coromandel International Limited, Haifa Chemicals Limited, Yara International ASA, The Potash Corporation of Saskatchewan Inc., Sociedad Quimica Y Minera S.A., Agrium Inc., and Israel Chemical Limited boast of their expansive geographical presence and are consistently improving their product portfolio to stay ahead of the curve. Most of these players are eyeing emerging economies in Asia Pacific that are prospering on economic growth and have a strong agriculture community. Based on product type, the TMR report has segmented the specialty fertilizers market into micro nutrient fertilizers, nitrification and urea inhibitors, controlled release fertilizers, and slow release fertilizers. Compound-wise, the market has been bifurcated into NPK, Potash, Phosphate, and Nitrogen. The study has also gauged the potential of demand that will be coming from crop types of fruits and vegetables, turf and ornamentals, and cereals and oilseeds, as well as the regions of Asia Pacific, Europe, North America, Middle East and Africa (MEA), and Latin America. 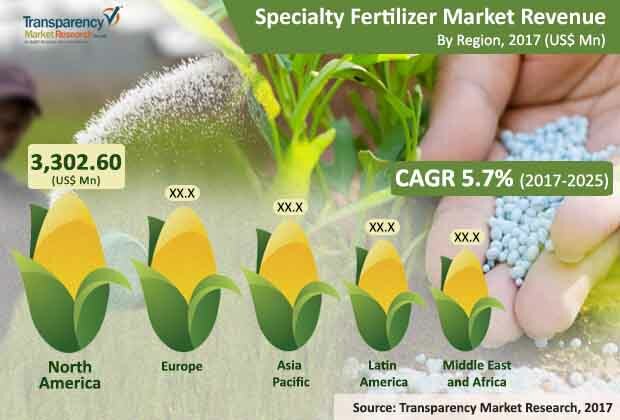 Some of the key factors augmenting the demand in the specialty fertilizers market are: easy handling, rapidly growing emphasis on greenhouse vegetable production across urban areas, and government emphasis on environmental concerns. Indulgence of food product manufacturers into collaborations with agriculture organizations is also expected to pave new revenue avenues in this market. On the other hand, lack of awareness, growing prices of natural gas, high cost, and growth of the organic fertilizers industry are some of the restraints obstructing the prosperity of the specialty fertilizers market. Nevertheless, the vendors stand to gain newer opportunities in emerging economies of Asia Pacific.